Bardon Composite Pavements have recently completed a contract which involved mixing and laying a HBM (Hydraulically Bound Mixtures) road sub-base using the newly launched weighing version of the RMX400C, mobile continuous mixing plant, from Rapid International Ltd. This contract on the Longford Bypass in Ireland involved mixing and laying HBM road sub-base which was a CBGM C16/20 with local aggregates. The mobile continuous mixing plant from Rapid International can produce up to 400 tonnes per hour and records the quantities by weight of each material added. The plant’s record keeping is automated, precise and detailed and provides Bardon with accurate information. The new RMC400CW model now incorporates a 1200mm belt conveyor between the aggregate hopper and the continuous mixer. The weighing belt is supported on load cells and this measures the weight allowing the feed rate of the aggregate to be determined. The new plant also incorporates a cement weigh system, using a rotary valve feeding a weighed screw with twin outlets for discharging into the mixer. The water is monitored using a flow meter. The pugmill mixer, incorporated into the plant is fitted with twin mixing shafts with mixing paddles configured to thoroughly mix the material whilst propelling the mix along the mixing chamber toward the outlet. A layer of base material is allowed to build up on the wall and floor of the chamber, protecting the rubber lined walls and base from wear. The cleaning system which is unique to the Rapid International continuous mixing plant is one of its key selling points for customers. As well as access lids on top of the mixing chamber, the sides of the mixer are hinged down hydraulically giving complete access to the paddles and interior for maintenance. Also the bottom of the mixer is formed by a conveyor belt, which is operated when clean out takes place, taking the waste material away on the conveyor. This greatly simplifying (and speeds up) the cleaning operation. The Longford Bypass is approximately 3km in length and is located on the N5 to the north and west of Longford in Ireland. The scheme is being carried out for the Ireland’s National Roads Authority by Wills Bros Ltd, Civil Engineering Contractors. Hydraulically Bound Mixtures describe soil or aggregate mixtures that use binders made from cement, lime, gypsum, granulated blast-furnace slag, air-cooled steel slag and coal fly ash (also known as pulverised fuel ash or PFA). These binders are known as hydraulic as they set and harden in the presence of water. Rapid International machinery is manufactured at the main plant in Tandragee, Northern Ireland. 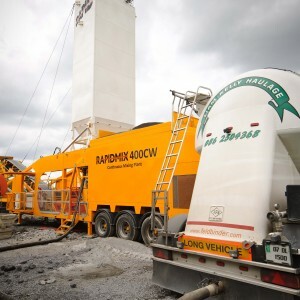 Accompanying the existing continuous mixing plants, the Rapidmix 400C and 600C, Rapid has expanded the mobile range with a series of mobile batching plants, the Rapidbatch and the new Transbatch. This range offers batch production of ready mixed concrete combined with full mobility and cost effectiveness for the client. Plants are completely self-contained allowing them to be used for on-site mixing in remote areas, giving savings in time, money and carbon emissions. 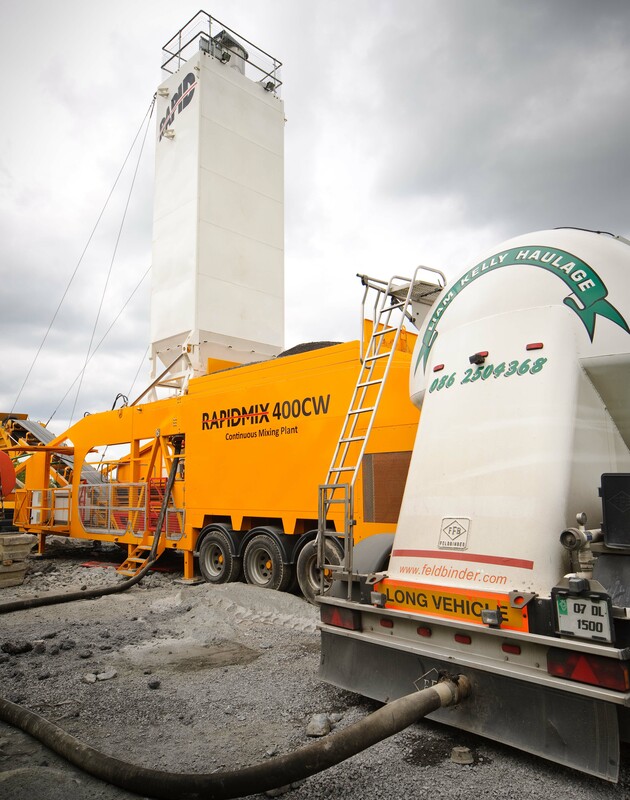 Rapid also manufacture concrete pan, planetary and twin shaft mixers for the ready-mix and precast industries.